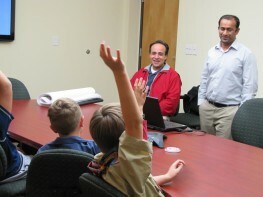 Boy Scouts Visit - Unintech Consulting Engineers, Inc. The Cub Scouts from Troop 428 visited our offices and enjoyed presentations by Project Engineer, Laxman Patil, P.E., CFM, CAD Designer Ivanoe Lozano, and Assistant Survey Manager Bill Forshey, P.E., R.P.L.S.They discussed the different types of engineering fields and how they affect us in everyday life. They also got a lesson in reading elevations with special surveying equipment. Then our engineers put them to the test and they were each rewarded with a small token. The Cub Scouts from Troop 428 visited our offices and enjoyed presentations by Project Engineer, Laxman Patil, P.E., CFM, CAD Designer Ivanoe Lozano, and Assistant Survey Manager Bill Forshey, P.E., R.P.L.S. San Antonio, TX – Employees showed their support for Breast Cancer Awareness Month with a Pink Out Day! San Antonio, TX – Employees collects 270 pounds of food for the San Antonio Food Bank to help with their annual Thanksgiving Food Drive. Employees collect toys for the San Antonio Police Department Blue Santa program.